Sketch H Showing the Progress of the Survey in Section No. VIII from 1846-1873. A very attractive example of the 1873 U.S. Coast Survey nautical chart or map of the Mississippi River Delta and environs. 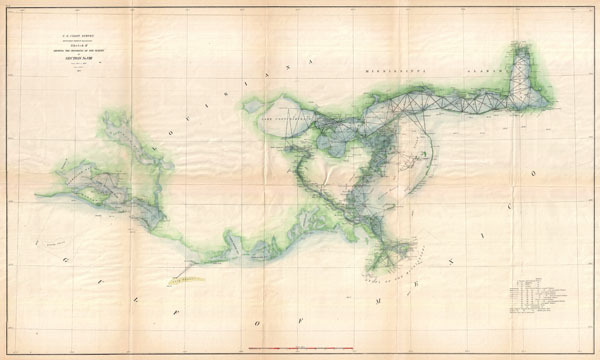 Centered on the fanlike river delta itself, this map extends westward as far as Marsh Island and Vermillion Bay and eastward along the Mississippi Sound as far as Mobile Bay, Alabama. The course of the Mississippi River is charted as far north as New Orleans and Lake Pontchartrain. Countless triangulation points are noted throughout, particularly in Cote Blanche Bay, the Mississippi River Delta, the Mississippi Sound, and Mobile Bay. The chart was produced under the supervision of Benjamin Peirce, Superintendent of the U.S. Coast Survey. Report of the Superintendent of the United States Coast Survey, (Washington) 1873. Good. This chart exhibits extreme brittleness throughout. There are a number of archival verso repairs and reinforcements - most along the fragile original fold lines. Original fold lines exhibit some additional toning.